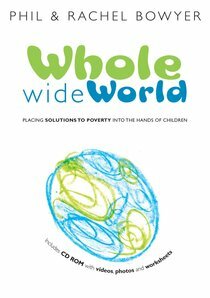 42 interactive devotions to help children (ages 4-11) and families find everyday ways to connect with the issues of poverty and injustice. Explores issues that interest children - water, weather and energy, food, shopping and school. Each devotion includes Bible stories, games, activities and ideas for action. Includes CD-ROM containing videos, photos, and photocopiable worksheets. About "The Whole Wide World"
Phil Bowyer is Tearfund's National Youth Specialist, responsible for managing training opportunities and producing resources for leaders and young people who want to see lives changed by God's word on issues of poverty, justice, and mission. He is also editor of Tearfund's Network magazine for youth leaders. Phil is married to Rachel and has a son, Zachary.